Kevin Lynch has just announced the availability of a new HTML5 Pack for Dreamweaver CS5 at the Google I/O Day 1 Keynote. CTO of Adobe has also showed a CSS 3 Animator tool, how to export a SVG file from a vector graphic created with Adobe Illustrator and the roundtrip with Dreamweaver that supports HTML 5. The pack for Dreamweaver CS5 will enhance the Web design application’s HTML5 support and includes the ability to preview what HTML5-based designs will look like across multiple devices. The HTML5 pack for Dreamweaver is available today on Adobe Labs. The HTML5 Pack for Dreamweaver CS5 is an extension that adds support for HTML5 and CSS3 in Dreamweaver. This article provides a brief overview of HTML5 and CSS3, and outlines the new features available in Dreamweaver once the extension has been installed. Read Using the HTML5 Pack for Dreamweaver CS5 article. Kevin Lynch has just said that the Flash Player will embed the new open source VP8 codec at the Google I/O Day 1 Keynote. Isn't that cool ? Can't image what he's gonna show at the MAX 2010 ! I'm watching at the Google I/O Day 1 Keynote live streaming over YouTube. For more information about WebM, see the FAQ. 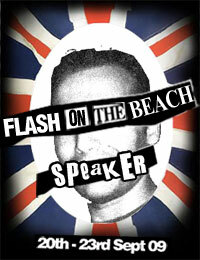 All tickets for each of the 5 workshops at Flash On The Beach 2010 are now sold out! Don't think too much or the conference will be sold out. FOTB is the right place to meet from the worlds best speakers. Maybe we should be making more noise about this - so, here it is - WE ARE GIVING ALL ATTENDEES TO FOTB2010 EXCLUSIVE ACCESS TO ALL 45 SESSIONS ON VIDEO! Can you imagine how much a training course would cost with the latest cutting edge content from the world's best shakers and movers would be? Then say you wanted to watch it over and over. In fact, make the training course 45 hours, in other words nearly a 6 day course! Well, that is in effect what you get when you attend FOTB2010! FOTB 2010 site has been published. 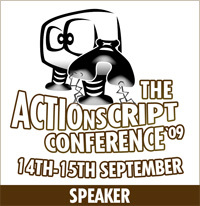 Content packed sessions covering creative, technical, inspirational, business. Tickets will go on sale around next later. Don't miss the opportunity to attend this awesome conference ! Getting to Adobe MAX 2009 on a budget. Get a $400 discount! Don't waste time thinking about it because MAX is only 10 weeks away !! Don't wait too long and take the lowest promotion ever for the Flash On The Beach 2009. Flash on the Beach 09 tickets will go on sale on Monday at 10:00AM UK time. We have reduced hundreds of tickets to the lowest price ever. The first 50 conference tickets will go out at an incredible £129! The first 50 student tickets at an unbelievable £59! New this year are 'Singles' - these are single day tickets. If you want to hear the latest news, offers, speaker additions and competitions, we broadcast in a couple of places: our newsletter and twitter.